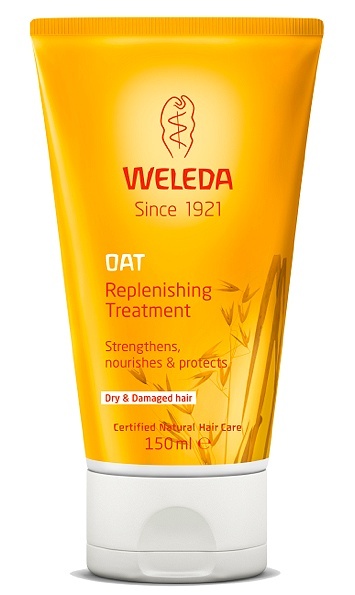 Oat Replenishing Conditioner contains organic oat extract to help strengthen hair and reduce breakage and split ends. White mallow extract provides intensive moisture, while organic jojoba seed oil smoothes hair’s surface. Organic coconut oil will leave strands shiny and soft, and your senses will love the delicate, flowery scent of mimosa and tonka beans derived from pure essential oils. Ideal for all hair types, this conditioner can be combined with any of our shampoos and contains 89% organic ingredients. Ingredients (INCI)Water (Aqua), Alcohol, Cetearyl Alcohol, Behenyl Alcohol, PCA Glyceryl Oleate, Glyceryl Stearate Citrate, Glyceryl Stearate, Avena Sativa (Oat) Extract, Fragrance (Parfum)*,Isoamyl Laurate, Cocos Nucifera (Coconut) Oil, Simmondsia Chinensis (Jojoba) Seed Oil,Chondrus Crispus (Carrageenan) Extract, Althaea Officinalis (White Mallow) Root Extract,Xanthan Gum, Citric Acid, Arginine, Hydrolyzed Wheat Protein, Limonene*, Linalool*,Citronellol*, Geraniol*, Coumarin*.